The aim of this research project is to adapt and field-test the Achieve My Plan Plus (AMP+) workforce intervention, which is intended to improve cost-effective, practice-focused coaching within supervision for peer support specialists who work with youth and young adults with serious mental health conditions. Peer support specialists who provide support to youth and young adults with serious mental health conditions are usually between 18 and 30 years old, and they often have lived experience with mental health challenges and systems involvement (for example, special education, foster care, or juvenile justice). Research identifies several main challenges to successfully implementing the peer support specialist role for youth and young adults with serious mental health conditions. The main challenges include an unclear role description and a lack of high-quality, developmentally appropriate training and coaching to support the role. Researchers, policymakers, and government agencies have made it a high priority to train practitioners to work effectively with emerging adults (roughly ages 14 to 25). But the typical approaches to staff training and supervision are not enough to create and sustain reliable practice of mental health interventions. Research has shown that high-quality coaching should include observing practice (in person or through video or audio recording) and giving feedback in a way that is connected to the intervention theory and based on objective criteria. Pathways RTC is exploring a response to these challenges by developing and testing an enhancement for the youth or young adult peer support specialist role called AMP+. AMP+ adapts the original evidence-based activity called Achieve My Plan (AMP). AMP was designed to be carried out by (non-peer) providers who work with youth and young adults. A study of AMP showed that it was successful in strengthening providers’ skills in key areas for working effectively with youth and young adults. Specifically, AMP built providers’ capacity for working with young people in ways that help them engage in services and supports, develop self-determination skills, and participate in community activities and settings. AMP+ is designed to enhance more general types of peer support specialist training. AMP+ focuses on building skills that peer support specialists need to support young people as they identify and carry out goals, plans, and activities in the community. AMP+ responds to the challenges described above by providing a clear model for practice and measuring how well the practice conformed to the training. It provides a complete training and coaching through the internet to comply with best practices while keeping costs down. AMP+ trains and coaches by peers experienced in these roles and part of that provides a clear definition of skills related to “peerness” (that is, the ways that peer support roles differ from other provider roles, and how the unique aspects of these roles contribute to outcomes). AMP+ is delivered online in groups of about 5 to 15 peer support specialist trainees. The training includes interactive web conferences spaced across several months. Between the web conferences, peer support specialist trainees complete homework assignments that include going to an online video clip library to view examples of lower and higher quality practices. Peer support specialist trainees upload video recordings of their work with youth or young adults, and they get tailored feedback and coaching that uses a reliable scoring system. Pathways recently completed a pilot study of the AMP+ enhancement with 26 peer support specialists and their supervisors in two states. Study results show big improvements in peer support specialist trainee competencies for working with youth/young adults. These competencies were measured in two ways: by research staff members who rated peer support specialist practices in video recordings and through the peer support specialist trainees’ own (subjective) evaluations. 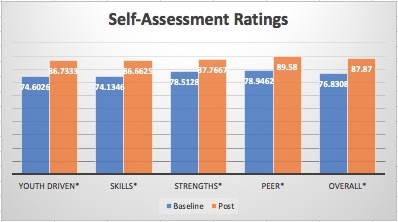 Competencies were assessed in four general areas: using a youth-/young adult-driven approach, promoting skill acquisition, using a strengths approach, and understanding the peer role. In addition, an overall rating was obtained by calculating average ratings in each area. 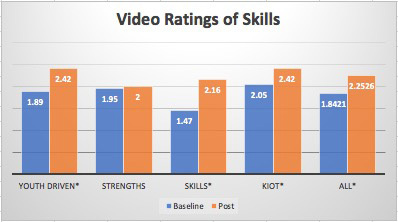 The ratings of peer support specialist video material, in which the specialists were rated, used a four-point scale (1 = beginning to 4 = skilled) showed improvements in each area (including overall competency) except for using a strengths approach. Ratings for trainees’ ability to keep it on track (KIOT)—in other words, to work through the planning process as described in the AMP+ enhancement—also showed major improvement. In the self-assessments, trainees used a scale (0 = none at all to 100 = complete) to rate their confidence to carry out specific skills in the four areas of competence. These self-assessments showed great improvement in each area and overall. 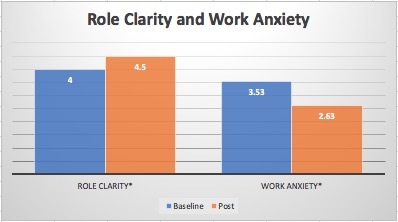 Also, peer support specialist trainees’ ratings showed a large increase in perceptions of role clarity and a decrease in perceptions of work-based anxiety (each measured on five-point scale). Lastly, trainees were highly satisfied with the training/coaching experience. In future work, Pathways staff plan to build on these findings by measuring the impact of AMP+ on youth and young adult engagement in services and person-centered planning and on their levels of community participation. Future research also will continue to measure the skills that peer support specialist gain through the training, plus the levels of role clarity and work anxiety that they experience. Many of the lessons learned from the AMP+ study have to do with the “remote” approach to training and coaching (training and coaching provided through the internet). Study data show that this approach, which follows best practices for making sure training content is transferred into practice, can be carried out with less expense than usual peer support specialist training. Typical training includes 40 hours of in-person training with little or no observation and feedback from trainers who are experts in the practice. Also, many of the training elements (for instance, watching practice examples through the online training platform) can be done whenever trainees have free time. This enables them to make productive use of down time. Despite these advantages, agencies and peer support specialists are not using this training approach, which depends on trainees being more active in completing training requirements. Many of the lessons learned had to do with how the trainers could work with peer support specialist trainees and their supervisors to ensure that they completed all aspects of the training in a timely manner.